Take 1 Field Spell from your Deck, and either activate it or add it to your hand. This card is unnecessary. It’s a shame that Konami still creates filler garbage like this. Now if this had allowed you to bounce a field spell in play and then play another one from the deck, that would have been creative and useful… but nope. Trash. And there’s no reason to believe Terraforming will ever be restricted or banned. If that day were to come, I could maybe see this being used, which is why I won’t give it a terrible future potential rating. Still, this is a bad card right now. Slow, slow, slow. We continue our Top 10 Circuit Break cards with what should have replaced Terraforming: Metaverse. A Trap, you search out a Field Spell from the deck and can either play it or add it to your hand. Trade quickness for options. While Terraforming was faster, this card is balanced and still allows for activation right away, no matter the turn. Field Spells that search like Union Hanger can add an extra search during your opponents turn and add to your resources. This is Terraforming in Trap form. Trade speed for the ability to disrupt your opponents turn or search out your Field Spell before your turn comes up. We start off a new week by getting into the Top 5 of Circuit Break, and at the #5 spot we got the Terraforming replacement, Metaverse. Metaverse is a simple Trap that lets you take a Field Spell from the deck and either activate it or add it to the hand. Sometimes you will be adding it, but if it doesn’t hurt to activate it immediately, like with PSY-Frame Circuit, you can straight up activate it. It is a good card, but while Terraforming and Set Rotation are at 3, this card will always be inferior. I’m surprised Metaverse made this list, let alone so high on it, given this is such an average card. 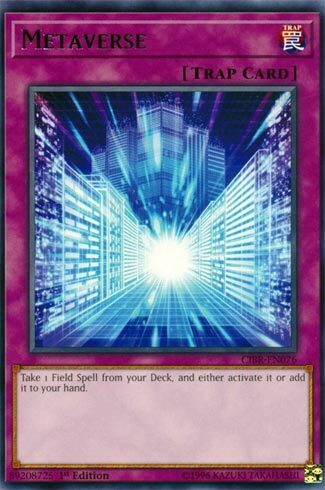 I know Yugioh has tried to make Field Magic Cards relevant, and there are plenty that are, but this is essentially Terraforming in Trap form. You get the bonus of being able to activate the Field card after fetching it from your Deck, which is nice, but none of this should be game breaking enough to warrant this card being a staple in a Deck that so heavily relies on a Field card. Let alone top 10 in this set.